A new CBO report says the government's flood insurance program is about $1.4 billion over budget, and Congress can't agree on how to fix it. The government program that helps people rebuild after floods has a money problem. A new report by the Congressional Budget Office estimates the National Flood Insurance Program is $1.4 billion over budget. The majority of that shortfall comes from the fact that the program takes in less from insurance premiums from coastal counties than it's expected to pay out in any given year. 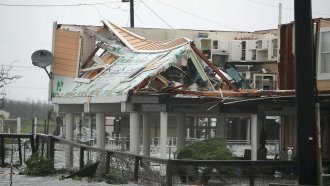 And the Government Accountability Office says the program is still trying to pay back the billions of dollars it borrowed from the Treasury Department to cover claims from Hurricane Katrina and Hurricane Sandy. On top of that, the program can only borrow about $5.8 billion more from the Treasury. And now it has the flooding from Hurricane Harvey to deal with. The NFIP mandates that residents of certain areas at risk of flooding purchase flood insurance. That covers 13 percent of people in Harris County, Texas, which includes Houston. The program is also running out of time. It's set to expire at the end of September, and Congress has been struggling to renew it. Politicians can't seem to agree on what reforms the program needs to help keep it solvent. Raising the program's premiums might help, but insurance holders aren't thrilled about the idea of paying more. That's translated to legislators who are also averse to change. As an example, in 2012 Congress passed the Biggert-Waters Act that began to phaseout some of the bigger financial pitfalls of the NFIP like subsidized premiums. But just two years later, Congress passed a new law that reversed parts of Biggert-Waters that aimed to make the NFIP more financially solvent. But there's also disagreement among politicians as to whether the government should be in the insurance business at all, or if the bulk of flood insurance should be passed off to private companies. It's not clear what, if any, changes will be made to the NFIP this time around. Congress still has to raise the debt ceiling and pass broad relief for victims of Harvey, so it's probably not looking for a big debate on the issue right now.